It's one thing to have a blog up and running, it's another to find people who are interested in your content. To find people who will be interested in what you have to offer in your blog, you will have to create awareness or promote your blog through different promotion models. Well, a lot has been written about how to increase traffic to one's site. A lot of SEO gurus have different things to tell you about increasing traffic to your blog. A quick search on Google will reveal tens of thousands of different methods of increasing traffic to your blog. While some of these methods are acceptable practices, others are not. I'm not here to tell you which one is acceptable and which is not, rather I want to show the little strategy I used to boost traffic to my blog. In short I received over 200% increase in traffic to my blog doing what I want to reveal. You agree with me that options 2 and 3 above will cost you some amount of money. For example, some blog directories will charge you as high as $499.99 to have your blog permanently listed in their directories. That's quite a huge amount of money to be spent, especially for a starter, who has not made any money from blogging but just struggling to make his/her first dime on the internet. Also the payment method accepted by most of these directories are not obtainable in some parts of the world. For example, most of the directories use PayPal as their only payment model. And we all know that PayPal is not available in every country of the world. For example, as at the time of writing this article, someone from my own part of the world cannot have his/her blog featured in a directory that accept only PayPal as the payment option, (even if he/she has such amount of money to pay) considering the fact that my country is blacklisted by PayPal. The reason best known to them. There is an alternative to all of the above. And the alternative is what I want to talk about right away. I did it and the result was so effective, my traffic increased considerably. Look for blog directories that charge you as high as $499.99 to have a blog listed in their directories. They charge as much as that because of their popularity. Also know that such directories don't normally accept poor quality blogs. So any blog that's featured on their home page must be a high quality blog and worthy of note. In such directories, there are top featured blogs, or the most popular blogs, the top featured listing, limelight blogs, the most popular blogs of the week, etc. Each blog directory has its own way of describing the most popular. For such blogs, the owners have paid some amount of money to have their blogs placed in limelight position in the directory, and some probably moved up the ladder based on user reviews. Visit blog directories and look for such blogs in limelight position. Search for blogs in your niche, look for article of interest, something for which you have a deep knowledge of and leave your contribution in the comment section. Make sure your comment is educative/informative, relating to the topic of the article. Also try as much as possible to be the first person to comment. Some of the blogs even allow one to insert targeted keywords in the comment section. If your comment is educative enough, people will click on the link you have inserted in your comment. For example, let's say your blog is on "How to make money online", visit all the blog directories you can find, look for top listing blogs and search for blogs on how to make money online. Look for a post that interest you and leave your comments. For blogs that permits you to link to your site in the comment section, you can use anchor tag to create links to you site. In case you don't have any idea about HTML here is the syntax of anchor tag <a href="#">Anchor</a>. Replace the hash tag (#) with the URL of the page you want to link to, and replace the word "Anchor" with the keyword you want to use to appear as a clickable link. However, do not abuse the opportunity by spamming their website. And be sure that your comment is related to the content of the page, or it will not be approved. Not every blog will permit this from you. For blogs that permit that, make sure you visit them frequently. Subscribe to them so that you will be among the first to be notified of new post, so you can be among the first to comment. Give it a try and see the awesome result that comes from it. A lot of blog directories are out there for you to implement this strategy covered here. 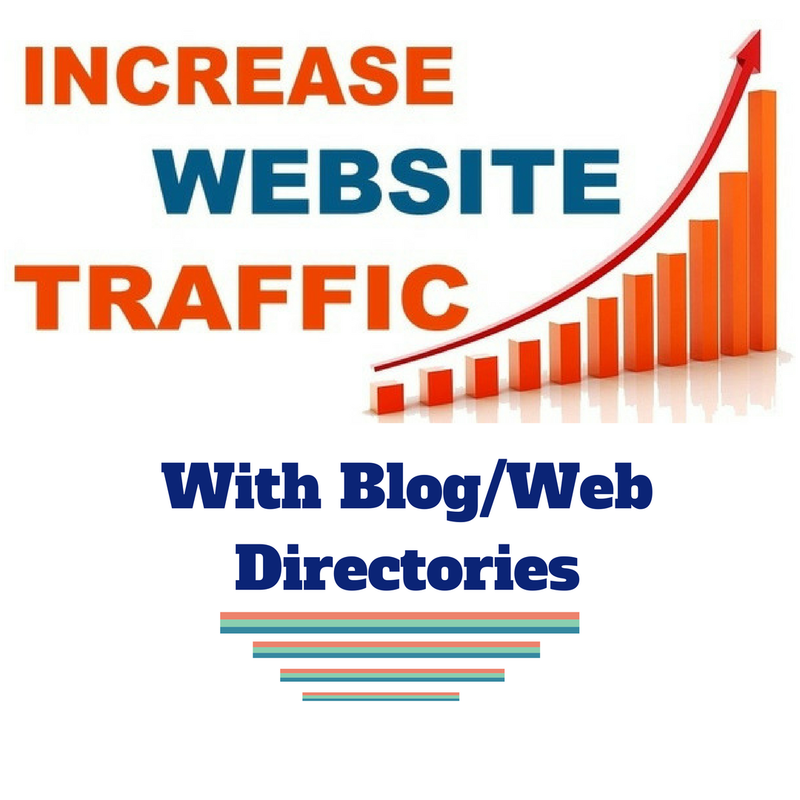 A quick search on Google will reveal a lot of them, but to save you time, here is a list of blog directories to use to increase traffic to your site.